On Thursday, October 12, 2017, the third group of Iraqi Air Force pilots has completed their L-159 conversion training. Aero Vodochody currently continues training Iraqi ground personnel and flight instructors. The graduation ceremony of the third group of L-159 pilots in Aero Vodochody was attended by representatives of the Iraqi Air Force, the Czech Air Force and representatives of the Ministry of Foreign Affairs of the Czech Republic, Iraqi Ambassador Walid Hamed Shiltagh and Aero Vodochody management. "Satisfaction with the L-159s and their deployment in combat operations is not the only aspect of successful cooperation between Aero and its customer. Aero proves its quality and competitiveness by being able to offer comprehensive services, including flight personnel training, aircraft maintenance services and other customer support," says Aero Vodochody President Giuseppe Giordo. Training of pilots, ground staff and instructors is a part of a contract between AERO Vodochody AEROSPACE a.s. and the Ministry of Defense of Iraq. Aero provides its customers with a broad range of ground personnel and flight training services. Instructors with many years of experience in the field conduct the training. The conversion training of the L-159 pilots includes the theoretical part, flight simulation training and flight training. The flight training itself includes basic conversion training, weapon training, and emergency procedures. 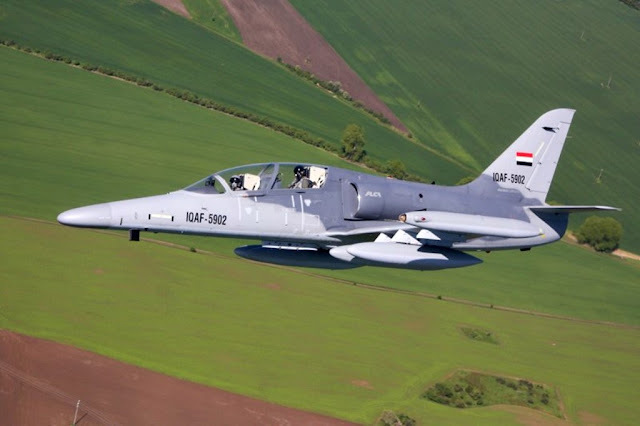 Aero signed the contract with the Ministry of Defense of Iraq to deliver the L-159s in 2014. In total, the country supplied ten single-seat L-159As and two two-seat L-159T1s. So far, the Iraqi Air Force L-159s have completed several hundreds of combat flights. The main features the aircraft offers in support of operations effectiveness are easy maintenance, modern equipment and good maneuverability.